Die Martis, 21° Februarii 1832. E. of Ranfurly's Claim, Com ee to meet. Staley v. King & Hindle. Certificate of Amount of the Fee Fund, delivered, & referred to a Com ee. Plurality of Benefices Bill presented. Clayton's Divorce Bill, Witnesses to attend. General Register Office, Petition from Wisbech against establishing. Ds. Dover. March. Lansdowne, Præses. Hodie 3a vice lecta est Billa, intituled, "An Act to authorize the Payment out of the Consolidated Fund of a Sum of Money towards the Erection of certain Revenue Buildings at Liverpool." 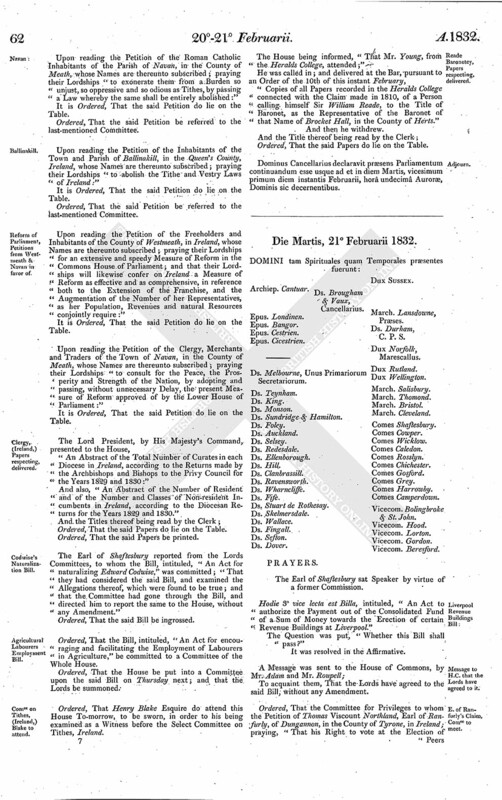 Ordered, That the Committee for Privileges to whom the Petition of Thomas Viscount Northland, Earl of Ranfurly, of Dungannon, in the County of Tyrone, in Ireland; praying, "That his Right to vote at the Election of Peers of Ireland, to sit in the Parliament of the United Kingdom, may be admitted by their Lordships," stands referred, do meet to consider of the said Petition on Friday the 2d of March next. Upon reading the Petition and Appeal of James Staley of Green Terrace, Clerkenwell, in the County of Middlesex, Builder; complaining of a Decree of the Court of Chancery, of the 2d Day of July 1831; and also of an Order of the said Court; of the 21st Day of January 1832, which Order was duly entered on the 16th Day of February 1832; and praying, "That the same may be reversed or varied, or that the Appellant may have such further or other Relief in the Premises, as to this House, in their Lordships great Wisdom, shall seem meet; and that John King and Thomas Hindle may be required to answer the said Appeal:"
It is Ordered, That the said John King and Thomas Hindle may have a Copy of the said Appeal, and do put in their Answer or respective Answers thereunto, in Writing, on or before Tuesday the 6th Day of March next; and Service of this Order upon the said John King and Thomas Hindle's Clerk in Court or Solicitor shall be deemed good Service. Hodie 3a vice lecta est Billa, intituled, "An Act for naturalizing Edward Codwise." Hodie 3a vice lecta est Billa, intituled, "An Act for more effectually improving the Road from Burford to Banbury, in the County of Oxford, and from Burford to the Road leading to Stow, in the County of Gloucester, and from Swerford Gate, in the County of Oxford, to the Road in Aynho, in the County of Northampton; and for making a new Branch of Road to communicate with the same." L. 4. Leave out from ("Gloucester") to ("also") in Line 5. The Earl of Shaftesbury reported from the Lords Committees, to whom the Bill, intituled, "An Act for repairing and otherwise improving the Road from Brough Ferry to South Newbold Holmes, and from Brough to Welton, in the East Riding of the County of York," was committed; "That they had considered the said Bill, and examined the Allegations thereof, which were found to be true; and that the Committee had gone through the Bill, and directed him to report the same to the House, without any Amendment." The Lord Speaker acquainted the House, "That the Clerk Assistant had prepared and laid upon the Table, "A Certificate of the Amount of the General Fee Fund of The House of Lords, from the 12th Day of February 1831 to the 12th Day of February 1832; and of the Application thereof." Ordered, That the said Certificate do lie on the Table. Their Lordships, or any Five of them, to meet in the Prince's Lodgings, near the House of Peers; and to adjourn as they please. With a Bill, intituled, "An Act to amend an Act for lighting the Town and Burgh of Paisley, and Suburbs and Places adjacent, with Gas; and to enable the Company thereby incorporated to increase their Capital Stock; and for other Purposes relating thereto;" to which they desire the Concurrence of this House. With a Bill, intituled, "An Act for making and maintaining a Road from New Windsor, in the County of Berks, to the Village of Twyford, in the Parish of Hurst, in the said County and County of Wilts;" to which they desire the Concurrence of this House. The House being informed, "That Mr. Plowden, from the India Board, attended;"
"No. 1.-General Statement of the Revenues and Charges of India, (exclusive of the Commercial Charges,) drawn from the Accounts presented to Parliament, also showing the Interest paid upon the Debts, and the General Result, in the Years 1827-28 and 1828-29, (those of the former Year further adjusted,) with the Estimate of the same for the Year 1829-30:"
Also, "No. 1. (A. )-Statement of the Revenues and Charges of the Presidency of Bengal, (exclusive of the Commercial Charges,) drawn from the Accounts presented to Parliament, showing also the Interest paid upon the Debts, and the Result, in the Years 1827-28 and 1828-29, with the Estimate of the same for the Year 1829-30:"
Also, "No. 1. (B. )-Statement of the Revenues and Charges of the Presidency of Madras, (exclusive of the Commercial Charges,) drawn from the Accounts presented to Parliament, showing also the Interest paid upon the Debts, and the Result, in the Years 1827-28 and 1828-29, with the Estimate of the same for the Year 1829-30:"
Also, "No. 1. (C.)-Statement of the Revenues and Charges of the Presidency of Bombay, (exclusive of the Commercial Charges,) drawn from the Accounts presented to Parliament, showing also the Interest paid upon the Debts, and the Result, in the Years 1827-28 and 1828-29, with the Estimate of the same for the Year 1829-30:"
Also, "No. 1. (D.)-Statement of the Revenues and Charges of the Settlements of Prince of Wales Island, Singapore, Malacca and St. Helena, (exclusive of the Commercial Charges,) drawn from the Accounts presented to Parliament, showing also the Interest paid upon the Debts, and the Result, in the Years 1827-28 and 1828-29, (those of the former Year further adjusted,) with the Estimate of the same for the Year 1829-30:"
Also, "No. 2.-An Account of the Total Annual Amount of the Revenues and Charges of the several Presidencies in India for the Years 1827-28 and 1828-29, with the Estimate of the same for the Year 1829-30, as laid before Parliament; distinguishing, as to the Revenues, the Revenues realized in the original Possessions of The East India Company from the Subsidies from Native Princes or Collections from Ceded and Conquered Countries; and as to the Charges, the Military Charges, and the Charges for Buildings and Fortifications, from Civil, Revenue, Judicial and Marine Charges; showing also the Net Charge of Bencoolen, Prince of Wales Island, &c. likewise the Interest paid upon the Debts, and the Amount of Territorial Charges paid in England:"
Also, "No. 2. (A. )-Statement of the Revenues realized in the original Possessions of The East India Company at Bengal, Madras and Bombay, in the Years 1827-28 and 1828-29, with the Estimate of the same for the Year 1829-30:"
Also, "No. 2. (B. )-Account showing the Gross and Net Receipts from Subsidies under Treaties with the Native Princes of India, or from the Revenues of the Ceded and Conquered Countries, in the Years 1827-28 and 1828-29, with the Estimate of the same for the Year 1829-30:"
Also, "No. 2. (C.)-Statement of the Civil, Revenue, Judicial, Marine and other Charges (exclusive of the Ceded and Conquered Countries) defrayed at Bengal, Madras and Bombay in the Years 1827-28 and 1828-29, with the Estimate of the same for the Year 1829-30:"
Also, "No. 4.-An Account of the Amount of the Bond and other Territorial Debts owing by The East India Company at their several Presidencies in India on the 30th April in each of the Years 1828 and 1829:"
Also, "No. 6.-An Account of the Amount of the Assets of The East India Company at the several Presidencies and Settlements in India on the 30th April 1829; distinguishing the Territorial from the Commercial Assets:"
Also, "No. 7.-Abstract Statement of the Result of the Debts and Assets of The East India Company in all India on the 30th April 1829:"
Also, "No. 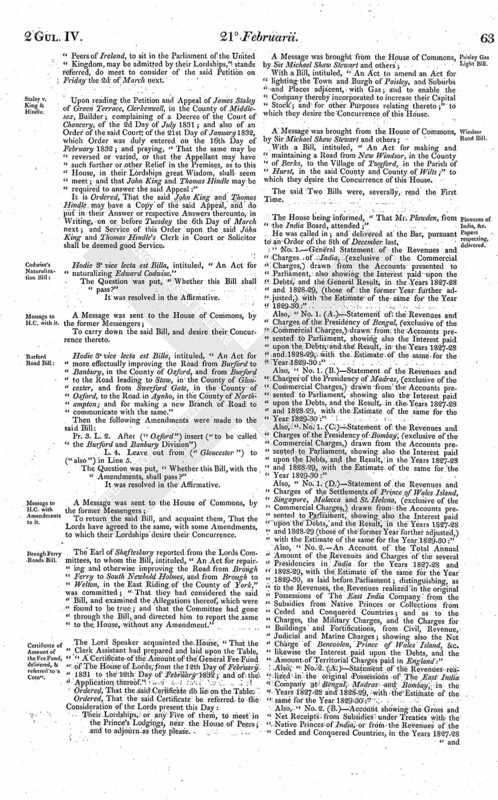 21.-General Statement, showing the Amount of the Proceeds of the Sales of Goods and Merchandize of The East India Company in Great Britain, and of their Commercial and other Receipts, Charges and Payments in Great Britain, under the several Heads thereof, for the Year 1830-31, according to the Annual Account presented to Parliament; distinguishing the Receipts and Payments in the Political and Territorial Branch from the Receipts and Payments in the Commercial Branch:"
Also, "No. 23.-General Statement of the Bond Debts and Simple Contract Debts of The East India Company, with the Rates of Interest they respectively carry, and the Amount of such Interest, and the State of Cash remaining in the Treasury, and other Effects appertaining to the Company, in Great Britain and Afloat, on the 1st May 1831; distinguishing the Debts and Assets in the Political and Territorial Branch from the Debts and Assets in the Commercial Branch:"
And also, "No. 27.-An Account of the Sale Amount of the Company's, the Private Trade, and the Neutral and Prize Goods, &c. sold by The East India Company in the Year 1830-31." Ordered, That the said Papers be printed. The Lord Archbishop of Canterbury presented to the House a Bill, intituled, "An Act to restrain and regulate the holding of Plurality of Dignities and Benefices by Spiritual Persons." Ordered, That General Samuel Brown, Mary Ann Biggs, Mary Ann Otto, Jane Millwood, Charlotte Millwood, Mary Southgate, George Glen, Thomas Cheetham, Robert Colbourne, Frances Mary Howard, John Leggatt, Jane Leggatt, Jane Allen, William Allen, Blythe Ann Allen, Ralph Spicer, William Stratford, Caroline Ann East, The Reverend Veitch, Mrs. Eleanor Veitch, and Thomas Rolls do attend this House on Tuesday next, in order to their being examined as Witnesses upon the Second Reading of the Bill, intituled, "An Act to dissolve the Marriage of William Robert Clayton Esquire with Alice Hugh Massy his now Wife, and to enable him to marry again; and for other Purposes." 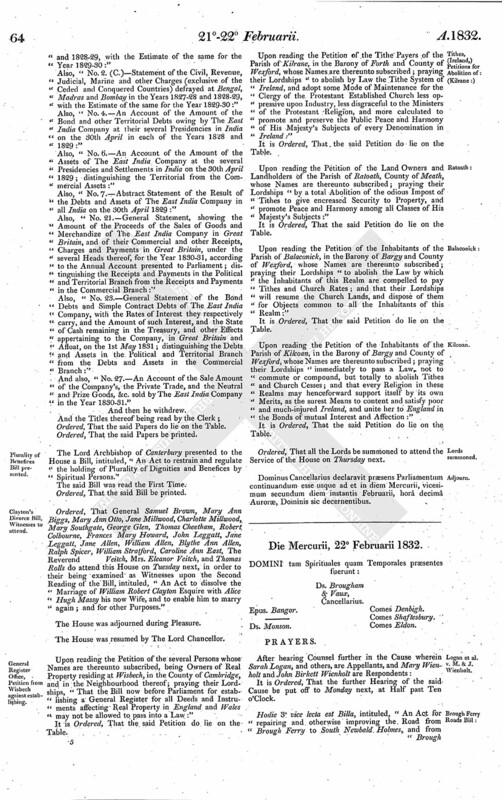 Upon reading the Petition of the several Persons whose Names are thereunto subscribed, being Owners of Real Property residing at Wisbech, in the County of Cambridge, and in the Neighbourhood thereof; praying their Lordships, "That the Bill now before Parliament for establishing a General Register for all Deeds and Instruments affecting Real Property in England and Wales may not be allowed to pass into a Law:"
Upon reading the Petition of the Tithe Payers of the Parish of Kilrane, in the Barony of Forth and County of Wexford, whose Names are thereunto subscribed; praying their Lordships "to abolish by Law the Tithe System of Ireland, and adopt some Mode of Maintenance for the Clergy of the Protestant Established Church less oppressive upon Industry, less disgraceful to the Ministers of the Protestant Religion, and more calculated to promote and preserve the Public Peace and Harmony of His Majesty's Subjects of every Denomination in Ireland:"
Upon reading the Petition of the Land Owners and Landholders of the Parish of Ratoath, County of Meath, whose Names are thereunto subscribed; praying their Lordships "by a total Abolition of the odious Impost of Tithes to give encreased Security to Property, and promote Peace and Harmony among all Classes of His Majesty's Subjects:"
Upon reading the Petition of the Inhabitants of the Parish of Balaconick, in the Barony of Bargy and County of Wexford, whose Names are thereunto subscribed; praying their Lordships "to abolish the Law by which the Inhabitants of this Realm are compelled to pay Tithes and Church Rates; and that their Lordships will resume the Church Lands, and dispose of them for Objects common to all the Inhabitants of this Realm:"
Upon reading the Petition of the Inhabitants of the Parish of Kilcoan, in the Barony of Bargy and County of Wexford, whose Names are thereunto subscribed; praying their Lordships "immediately to pass a Law, not to commute or compound, but totally to abolish Tithes and Church Cesses; and that every Religion in these Realms may henceforward support itself by its own Merits, as the surest Means to content and satisfy poor and much-injured Ireland, and unite her to England in the Bonds of mutual Interest and Affection:"
Ordered, That all the Lords be summoned to attend the Service of the House on Thursday next. Dominus Cancellarius declaravit præsens Parliamentum continuandum esse usque ad et in diem Mercurii, vicesimum secundum diem instantis Februarii, horâ decimâ Auroræ, Dominis sic decernentibus.